Sigh. "Here we go again," you groggily think to yourself. No one wants to be awake at 5am. So what's the deal these early morning risings and how can we fix them so that you're all getting more of the rest you need? WHAT IS AN EARLY WAKE-UP? 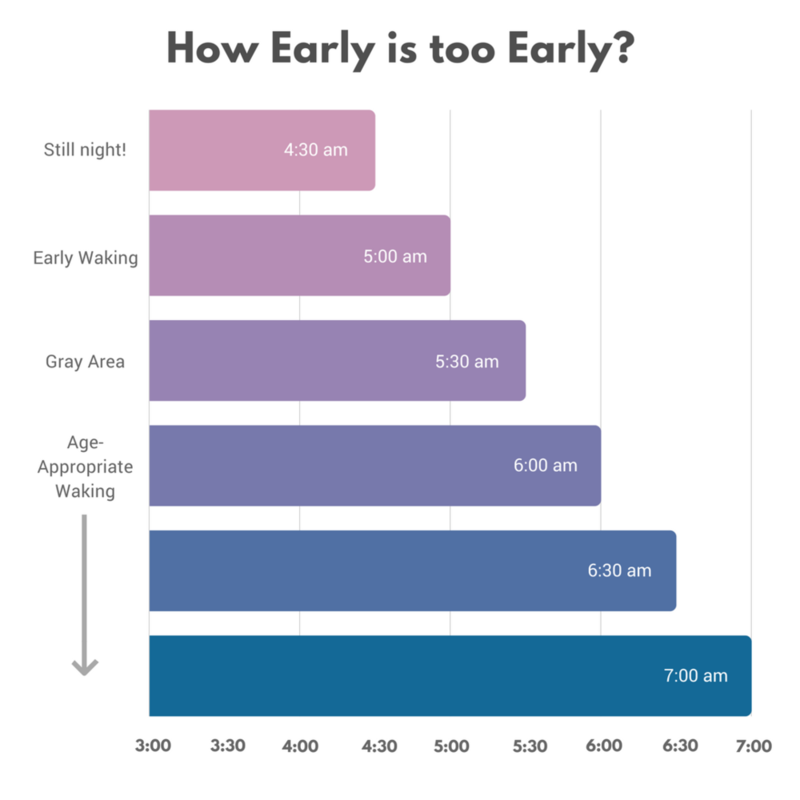 Let's start with defining exactly what an early waking is. Everyone has their own definition. Some people feel like anything before 5am is too early, while others don't want to be up before 8am. When it comes to children and their sleep needs, we must have realistic expectations. It's important to understand that their biologically-based circadian rhythm is set earlier than adults'. Children require earlier bedtimes than adults and often wake earlier than an adult naturally would. It's simply they way kids are built. How does this translate to morning wake times? Simply put, the vast majority of children's bodies are ready to wake up anytime between 6:00-7:00am. A waking before 6am is usually considered an early morning waking. Sleeping much past 7am throws the body's circadian rhythm off, which deteriorates all sleep quality (day, if the child is napping, and night). Did I just shatter your dreams of sleeping in until 8:30 with 15-month-old? Sorry to be the bearer of bad news. Blame it on biology. If your child is waking before 6:00am, there is hope for a later start to your day. There are many reasons your child could be waking too early, so let's do some investigating and figure out how to fix it. We'll start with the simplest potential problems and solutions and make our way to the more complex. 1. Light exposure - If ANY light is coming into your child's room in the early morning hours, it may very well be contributing to their early wakings. Light plays a huge role in queuing the body clock. Even the teeny-tiniest amount of light creeping around through the window can signal to your child's brain that it's morning and sleep time is over. How to fix it: Cover that window! Every square centimeter of it! It doesn't have to be pretty, but it needs to work. Get a roll of masking tape and foil or black poster board and go to town. There are also a variety of products that will help keep the room pitch-black. Some effective ones velcro directly into the window frame, covering the window completely. I find that simply putting up standard black out curtains over a window with regular blinds doesn't work well at all. Light comes around all the edges of the curtains, if not through the curtains themselves, too. So do some brainstorming and get that room DARK. 2. Environmental noise - The lightest sleep stages occur in the last couple of hours of night sleep. If the garbage truck rumbles by your house at 5:30am, the birds start chirping, a parent is getting ready for work, or even if the furnace kicks on, it may be just enough to startle your little one out of their light sleep and wake them for the day. How to fix it: Get some white noise going in their room. White noise will help to drown out the environmental sounds and keep them asleep longer in the morning. You can purchase a white noise machine or use a portable fan in the room. Whatever you choose, the noise should be non-rhythmic and relatively loud (around 50-60 dB) to be the most effective. 3. Exciting morning activities - If your child is waking too early in the morning and immediately (or soon) after they wake they get to do something especially enjoyable, that activity alone will reinforce their early rising. Some of the most common things I see happing right after a child wakes are snuggling in bed with mom and dad, nursing or bottle feeding, and using screens (like an iPad or TV). If a child knows that as soon as they wake up, they get to do one of their most favorite things, their brain will pull them awake instead of connecting another sleep cycle. How to fix it: Create a buffer of time between waking up and getting to do any especially exciting activities. Changing a diaper, getting dressed, or quietly coloring or doing puzzles are good things to fill that buffer of 15-30 minutes with. After that time has passed, nurse or bottle feed outside of your bed, turn the cartoons on a for bit, and pull out the sippy cups of milk. 4. Bedtime - The most common cause of early wakings is a bedtime that is too late. A child's worst enemy is being overtired. Over-fatigue leads to poor quality sleep, including premature wakings. I know it seems counter-intuitive, but a later bedtime does not equate to a later morning wake time. The opposite is almost always true, that a later bedtime will actually lead to earlier morning waking. Sleep begets sleep. The best quality sleep occurs the first half of the night, so the more of it your child can get, the better they will sleep the entire night. How to fix it: Move bedtime up. Even 30 minutes earlier can make a big difference in the morning. If your child's bedtime is usually 8:00pm, move it 7:30pm for a week or two. With time and consistency, their body will adjust and they should start waking later in the morning. 5. Independent sleep skills - If your child relies on anything external to get themselves to sleep, no sleep magic can happen - not at bedtime, throughout the night, or in the early morning hours. If you have to constantly replace her pacifier, rock her, nurse her, walk around with her, etc., then you can't expect her to be able to fall back asleep if she wakes prematurely in the morning. How to fix it: Sometimes independent sleep skills are mastered simply with time as your child gets older, but usually some sort of sleep training is necessary to break the poor sleep habits. There are a variety of methods to teach a child to sleep independently, so choose a method you are comfortable with, implement it, and stick to it 110%. 6. Nap schedule - We are now getting into the more tricky aspects of potential early waking causes. Some general things to look at, though, are when naps are occurring. If the morning nap is too early, it will perpetuate the early waking cycle because that early nap acts as a continuation of night sleep. If your baby wakes at 5:30 and then naps at 7:15, she's waking briefly in the "night" and then going back to sleep to finish off her night sleep. And then her entire day's naps are thrown off of her circadian rhythm, she's probably trying to compensate with an extra early bedtime, and the vicious cycle just continues. In the same vein, if the last nap of the day is ending too far in advance of bedtime or too soon before bedtime, morning waking will definitely be affected. How to fix it: This is where it is critical to follow your child's biologically-based circadian rhythm. Every child experiences "sleep waves" throughout each 24-hour period, in which their body primes itself for sleep. When sleeping during these waves, sleep is the most restorative. If a child is sleeping off this rhythm, it will perpetuate unhealthy sleep habits, like early morning wakings. Aim for an age-appropriate sleep schedule and keep it consistent. 7. Maxing out on sleep - This is the very last thing I consider when a child is waking prematurely in the morning. It's quite uncommon, but it is still a possibility. Some children wake in the morning because they have simply had enough of their 24-hour allotment of sleep and so they're just done sleeping. Sleep needs vary by age and child, so it is critical to assess whether your child is getting the right amount of sleep they personally need. How to fix it: If all the other trouble-shooting attempts have been unsuccessful to move the morning waking later, it's worth trying to move bedtime later. This must be done very carefully and consistently though, or it will surely backfire. Move bedtime 10 minutes later every 3-4 days until it is 30 minutes later than the original time. Over a period of 2-3 weeks, if your child was indeed maxing out on sleep, their morning wake time should have also followed suit, and be 30 minutes later too. 8. Stick to your minimum - My last piece of advice is to set a cut-off and stick with it. If you decided that morning doesn't start before 6:30am, then it doesn't start before 6:30am. If your child wakes at 6:25 and you decide that it's close enough to 6:30 so you get them up and start the day, now your morning cut off has moved to 6:25. Be warned: that wake time has a way of creeping earlier and earlier. The next morning it might be 6:20, then 6:10, and before you know it, you're waking up at 5am. As long as you stick to your minimum and don't allow morning to start before that time, your child will adjust and over the course of a few weeks, start sleeping until that time (or later!). 9. BONUS TIP! If you have a child over the age of 2, consider using a toddler clock in addition to the tips above. These clocks help young children understand when it is night time and when it is morning by glowing different colors. They can be magical little devices for keeping children in their rooms until morning. Stay tuned for a blog post all about toddler clocks - which ones are the best, how to introduce the clock, how to troubleshoot if your child doesn't seem to care about it, and more - coming soon! If you haven't already, subscribe to the blog so you never miss post! IS IT POSSIBLE THAT MY CHILD IS JUST AN EARLYBIRD? Yes, it's possible. Some children are just early risers. Their body clocks are biologically set early, relative to most others. If this is the case with your child, try to make peace with the fact and plan your life around it more. That may mean that your bedtime needs to move up so you can wake up with your early-riser happily. Do remember that it won't last forever. Like nearly everything with children, this too is a phase, and as their sleep needs change and mature, their early rising will eventually cease. While this list is fairly comprehensive as to what may be causing your child to wake early in the morning, there are many factors that can be working together to make it hard for your little one to sleep. Each child has unique sleep needs. If you feel like you've tried everything but nothing is working, contact me for a free 15-minute consultation. We can get your little one (and you) sleeping longer in the morning, for sure.